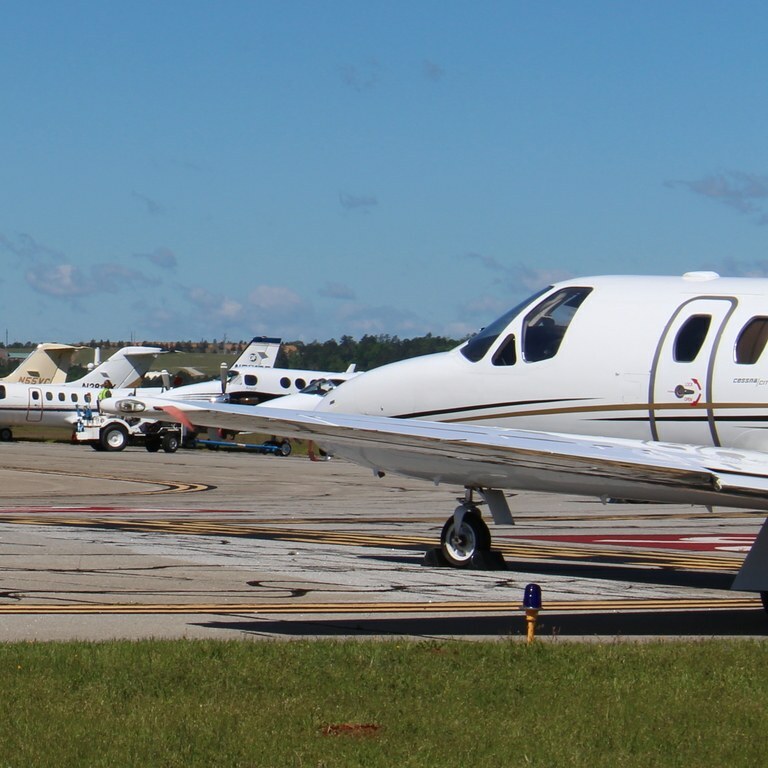 Flying private into Augusta has become increasingly popular for players and Masters attendees. AUGUSTA, Ga. — It’s Wednesday morning at 10, a dozen miles south of the most exclusive golf club on the planet, and lined up like giant aluminum sardines is the highest concentration of private jets at one airport anywhere in the world. But there’s a problem: A ground stop was just issued for Augusta Regional Airport. No, the President isn’t coming to town, nor are the earlier predicted thunderstorms. In air traffic control parlance, it’s due to “saturation.” It’s simply too crowded for any more planes to land or take off. It’s Masters Week, the way the other half does it—the 1 percent of the 1 percenters. Fifty-one weeks a year, depending on flight schedules, a plane will take off or land approximately every 30 minutes, sometimes longer, at little Bush Field, where a couple of country roads meet amid the pines and its two runways. For much of this week, it’s every five, with one of the runways shut down and turned into a parking lot, something the airport started doing a couple of years ago to make room. 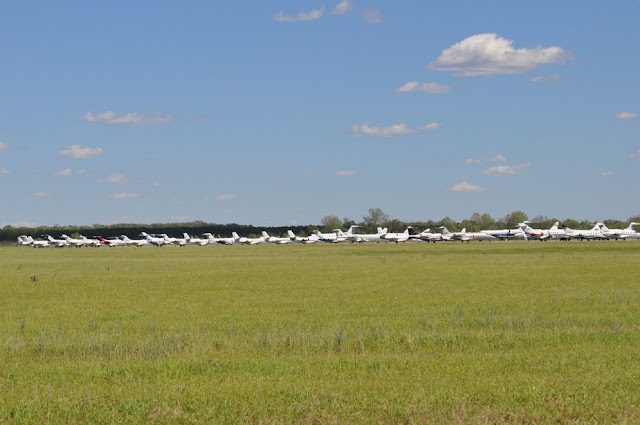 On the eve of this year’s tournament, some 200 jets are already parked and through the course of the week more than 1,500 in all will come through the gates. Other airports—nearby Daniel Field, which is closer to the course but smaller, and Aiken (S.C.) Municipal Airport—can handle any overflow. The commercial airline traffic is up, too, of course, with additional direct flights from Washington, D.C., Dallas-Fort Worth, New York, Philadelphia, Chicago and Canada added just for this week. A representative from Delta said they’re up about 70 percent in seats versus a normal period and about 7 percent higher than a year ago (call it the Tiger Woods Effect). The airline also added extra flights from its hub in Atlanta as well as bigger planes. In all, the airport will see about 20,000 passengers come through the doors during the week, many of whom pay between $5,000 to $25,000 an hour to fly private. One bigwig from Texas who first attended the Masters in the mid-1980s remembers a different scene as his father-in-law’s King Air Jet touched down the year Ben Crenshaw would go on to win the tournament in 1984. In other words, as the tournament has grown—recent accouterments include the opening of the uber-lavish Berckmans Place in 2013, and a luxurious and sprawling new merchandise building that’s double the size of the previous one this year—so too has Augusta National as a place to be seen, rather than just a place for well-heeled golf nuts. The egg salad and pimento-cheese sandwiches still cost $1.50, but some traditions evolve. That, of course, goes for players, too. When Arnold Palmer first joined the tour in 1955, he and then-wife Winnie traversed the country in a 19-foot-long trailer. It wasn’t long before he understandably grew tired of that method of travel and began taking flying lessons. After winning the 1958 Masters, he leased a Cessna 175 and hired a part-time co-pilot to fly with him. Three years later, he purchased his first plane, an Aero Commander 500, and began flying regularly, including to Augusta National. By the late 1990s and with money exploding (again, the Tiger Effect), it seemed every player had followed suit when it came to private air travel with some—Tiger Woods, Phil Mickelson, among a few others—also owning their own plane, causing Palmer to once joke that he bought his plane after winning a second Masters and players nowadays buy one after finishing second. The same holds true for the non-playing clientele, all trying to get to a place that’s more than a two-hour drive east from Atlanta. Beyond the titans of business, that list of regulars includes everyone from ex-Presidents, to Saudi royalty, to a certain 14-time major winner and owner of four green jackets. According to multiple sources who were present for Woods’ arrivals at the airport earlier in his career, the young golfer used to ask the pilot to tell the crew on the ground to turn their backs and not look at him as he de-planed. Most passengers aren’t as demanding. Still, all that extra traffic requires extra bodies, which is why the airport, much the way Augusta National has expanded to adjust to the modern power game, brings on a couple hundred extra people, everyone from grounds crew to air traffic controllers, to help the operation move smoothly. It’s also not just the amount of people that has increased. With the longer of its two runways stretching 8,001 feet, the airport can oblige. That extra foot is important, by the way, because it means the runway can accommodate larger-bodied planes, such as the Boeing Business Jet and 747-400. 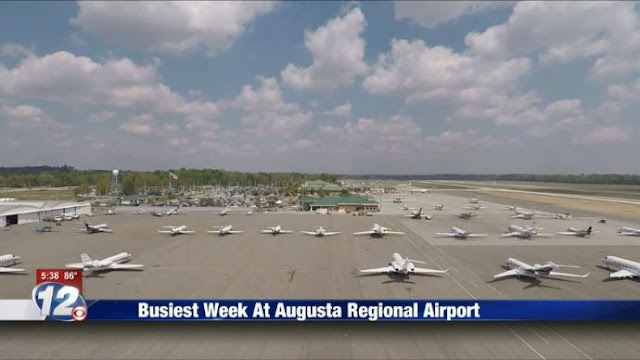 AUGUSTA, Ga. (WRDW/WAGT) – With the tournament going on, people from all over the world are flying into Augusta this week, bringing more traffic to local airports. Augusta Regional Airport Director Herbert Judon says they will see about 20,000 people fly in and out this week. That’s what they usually see in a full month. It’s the busiest time of the year for the small regional airport, and it’s also the most important. Augusta Regional usually just has flights to Columbia and Atlanta, but this week flight plans take planes to D.C., Dallas, New York and more busy hubs. Judon says he would like to keep those travel channels open all year round. Airport management is looking to the future, but there is a lot of extra work to manage throughout tournament week. A lot of private aircrafts park for the week at Augusta Regional, and all their open spots will be filled by this weekend. Passengers flying into Augusta Regional Airport are not disappointed with their rides. Starting Thursday, Judon expects the airport to be at capacity until the end of the tournament. $880.00 fee to drop passengers and leave left me "unimpressed".